Tattoos, a lot of us have them, and a lot of us are happy to share our experience about it, be it good or bad. The vast majority of my experiences have been good ones though, and with so many of mine having specific meaning behind them, I wanted to share those with you today. My first ever tattoo ended up being covered up a few years later, that wasn’t down to the design I chose but down to a bad artist who had convinced me he would do a good job. After he had inked me I realised how uneven it was and vowed that once I found a competent artist I would get it redone. Two years later I got a much better artist to do a cover up of it, keeping the design it just had to be made larger in order to become a cover up. Here is my before and after image below, including the fresh ink and fully healed. 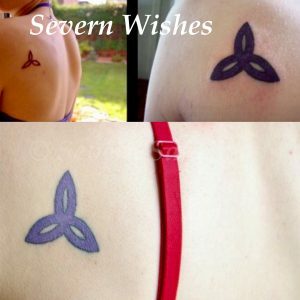 This Triquetra has family meaning for me. This experience didn’t put me off having tattoos, in fact I have ten, and I would have more one day too. Having always been a very creative person and artistic, it was something I wanted to happen from a young age. I waited until I was over eighteen to have my first inking, but after that I had a new tattoo roughly every six months for the next four years. Now I am going to tell you about a few of my tattoos, and some information about the sorts of things most people would ask. Such as how long it took and whether or not it was painful in that area. 1. Teal Butterflies (2 of them) In Memory of my two Grand Fathers who both adored Nature and Gardening. They are either side of my Lower Back. 2. Pisces Symbol – My Star Sign – One of the Pisces Traits is to be Indecisive and that is most definitely me! This Tattoo is on the outside of my Right Leg. 3. 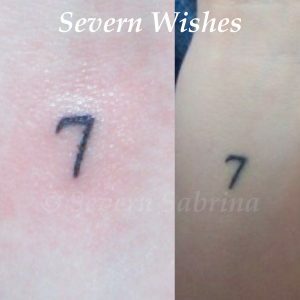 My Number 7 – I got this tiny and minimal tattoo after I had my Triquetra covered up, the artist was kind enough to do it as part of my sitting. Number 7 is my Lucky Number and my Birthday too! 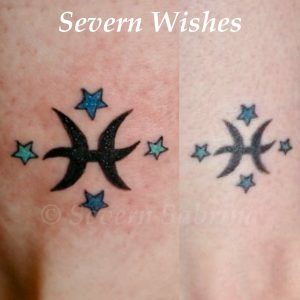 Right Wrist Tattoo. 4. 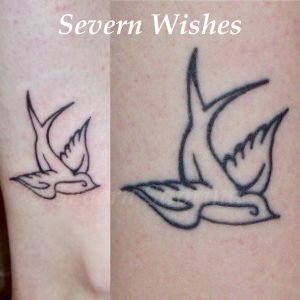 Sparrow – Symbolising New Beginnings, A Fresh Start and Freedom. This Tattoo is on the outside of my Left Leg. 5. 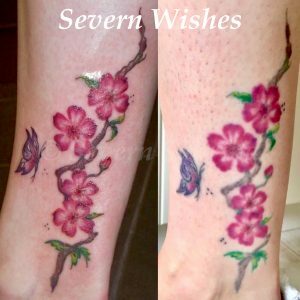 Cherry Blossom Branch – My favourite Tree and my first ever memory as a child was of the Blossom Tree in our Garden. I have always loved and adored pink blossom. This Tattoo is situated on the inside of my Right Leg. 6. Daisy Flowers – I have always loved nature and nature reminds me of home. I wanted these tiny flowers to remind me of that. The colour has sadly faded a little over time… Situated on my Left Hip. Here are my top tips and hints for deciding if getting a Tattoo is the right thing for you. I believe you should be asking yourself most (if not all) of my points below. My tip is to write down the pro’s and con’s and make sure you do consider some research too. Consider Timing, there is no point in getting a foot tattoo in the middle of freezing weather when you would have to cover it and therefore not letting it air and heal. 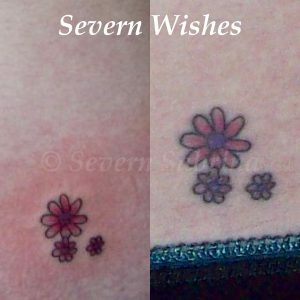 Or getting a Tattoo right before a holiday in the sunshine, this can ruin the tattoo or cause infection to the healing skin. 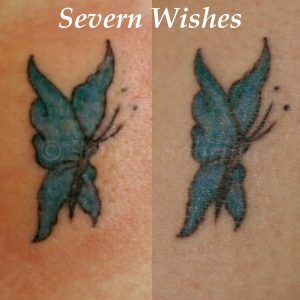 Start Small with your first Tattoo, committing to a full back piece isn’t usually a good idea if you aren’t certain how you or your skin may react to the procedure, think about if you have sensitive skin or eczema for example (your tattooist will also need to know this and any medication you are on). Of course many people “go big or go home” and decide to do a large tattoo or commit to a sleeve for example. This of course is your choice, and is something that only you can decide upon. Do you know your Pain Tolerance? This is a good question to ask yourself. Most people don’t realise that getting a tattoo has nothing to do with a phobia of needles or if you may have had many injections in your lifetime, it’s a totally unique experience and should be treated as such. Choose Wisely both with your Design and Artist. Do your research and look into local artists and further afield, because if you want a good tattoo be prepared to travel for the artist. With regards to your Design, once you’re happy with it stick it in a location where you will see it every single day for a month. If at the end of that month you still love what you’ve chosen, then the odds are that you will still enjoy looking at it when it’s on your skin, in many years to come. Use either Savlon or Bepanthen for After Care and apply regularly. Make sure that you keep the area clean and dry and air as often as possible to aid the healing process. I always used Savlon on all of mine, they healed beautifully and the colour has also remained in them all. Visit your chosen Tattoo Artist, book an appointment to talk to them, ask them any Questions you may have before you book an actual inking appointment. Take a friend or partner with you when you go, you may feel tired or uneasy after the inking is finished. You shouldn’t drive immediately after a tattoo or a piercing, give your body time to adjust to what has happened. Make sure you’ve drank something and eaten before you get inked, and take water with you to sip, especially if its in a warmer month of the year. Consider your bathing and sports when the tattoo is in the healing stages – no hot and forceful water can touch it and definitely no swimming because of the chemicals. Consider contact sports, if your tattoo could become easily knocked or bumped or is at risk of getting dirty and then infected. Be aware that your tattoo placement might cause you some inconvenience, you may need to be shaved (for example on your lower leg even if you’re a man), and you might be swollen for a couple of days afterwards as well. Make sure the tattoo won’t hinder any job role or uniform that you need to wear. This entry was posted in Health, Lifestyle, Photography, Piercings & Tattoos, Sabrina's Top Tips, Skincare, Tattoos by Sabrina. Bookmark the permalink.